With our friend John Lovett’s recent return to his home in the Piggs Peak area, we are able to get a first-hand account of the situation in Piggs Peak with regard to the fires and the drought. John writes “I spent some time traveling around to see the effect of the forest fire and the continuing drought; it seems that the Swazi people are never far from one disaster or another. Recent articles have spoken about the assistance we are providing to the people of Piggs Peak in the form of school fees for children and food and other provisions for those in need. The goal of the Hampton Piggs Peak Partnership is to alleviate the impact of HIV/AIDS in Piggs Peak where the incidence is estimated at 40%. Some people in Hampton have asked how providing food, clothing and access to education play a part in fighting AIDS. Over the past week we have received reports from our twin community of Piggs Peak telling us about a recent disaster in that town. Vusi Matsebula, the Town Manager, informed us of raging fires fueled by strong winds that have destroyed approximately eighty percent of the forest plantations in Piggs Peak. As many as 300 homesteads are reported to have been destroyed by the windstorms and the fire; infrastructure such as water systems that supply potable water also suffered damage. The forestry industry in Piggs Peak is one of the few sustainable sources of employment for the town and news reports from the area tell us that “many people will lose their jobs” The Swazi government has estimated the total number of people affected probably runs into several thousands and has declared the fires a national disaster. Furthermore, the fires have broken out at a time when about 40 percent of Swaziland’s one million people are facing acute food and water shortages after a prolonged drought and the worst harvest in the country’s recorded history. Vusi says “We are still reeling in shock”. 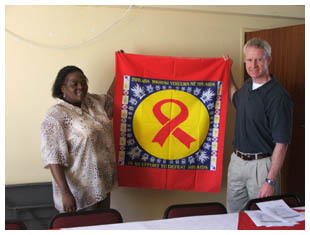 The funds being sent from Hampton to support projects at Nazarene Church, Fundukuwela High School and the town of Piggs Peak are intended to help prevent the spread of HIV/AIDS in that community. However, in a country where an estimated 40% of the adult population has this fatal virus, we are too often reminded that there is no cure and all we can do for those already afflicted is provide support the best we can. In a recent letter from John Lovett, our Canadian friend living in Piggs Peak, he tells of the fate of a young friend of his who lived at a nearby convent that operates a home for about thirty children with HIV/AIDS.